Carpentry work done by Cornerstone at a customer home. About Us | Bathroom & Kitchen Remodeling | Home Remodeling – Cornerstone Builders of SWFL, Naples & Fort Myers, FLMaybe you’d like to have new interior doors, custom cabinets and closets, or perhaps you want to spice up the rooms of your home with crown molding or new base molding. Maybe you’re looking for an update to your ceiling? A tray ceiling can take an out-of-style dome ceiling and turn it into an architectural feature. We have carpenters on staff that can remove walls, build walls, or cut a raised bar wall down to cabinet height. 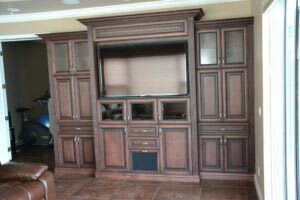 From cabinets, closets, and carpentry, as well as kitchen cabinet refacing, drywall, texture, and paint, we have the right people on staff to take care of your needs in Fort Myers, FL.